Is there anything more engaging than an artist’s sketchbook? Or even a notebook with a few sketches in it? I suppose the end product doesn’t have to be visual, it’s the insight into that conception/creation/ working it out process that I’m interested in, but imagery tends to be far more accessible, of course. I use Leonardo’s notebooks extensively in my Renaissance, Scientific Revolution, and early modern courses, and students are immediately engaged, entranced even, far more than they are when I show them the finished product. It’s interesting to see the wanderings of a very fertile mind in his case, what inspired him and what he also had to work out: perspective, motion, hands. Most of Leonardo’s sketches never made it onto canvas; once a particular challenge was overcome he moved on to the next one, but the sketchbooks of more (focused, disciplined, on-task???? it’s hard to compare Leonardo negatively to anyone) artists illustrate the progress from page to paint: those of Claude Monet immediately comes to mind. But again, it doesn’t have to be about images. The sketchbooks of Massachusetts artist Alvan Fisher (1792-1863), a pioneer in American landscape, genre, and “view” paintings, gives us insights into his preparation for one of the first views of Salem from “Gallows Hill”, a scene that would be imitated time and time again over the course of the nineteenth century. 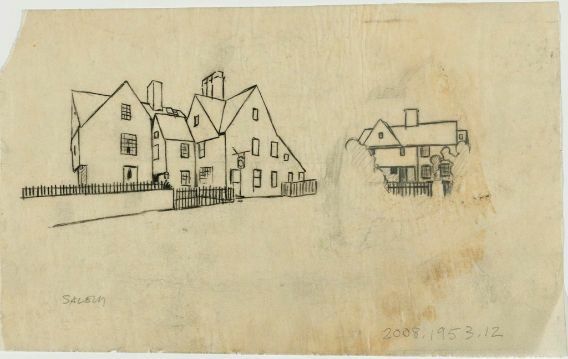 Fisher jotted down notes about the Salem Witch Trials in his sketchbook, indicating that his inspiration for the Salem painting was not just the view he saw before him, but the events that brought him to this particular place. Alvan Fisher’s View of Salem from Gallows Hill (1818), Collection of the Peabody Essex Museum, Salem, and Sketchbook no. 5, containing notes about the Salem Witch Trials, Museum of Fine Arts, Boston. With the recent validation of Proctor’s Ledge below rather than Gallows Hill above as the 1692 execution site, it occurs to me that the inspiration for this famous “view” is based on a falsehood! Indeed, I think that the figures in the foreground are sitting on THE ledge. But clearly a perspective from that point would not be as revealing of the city below. 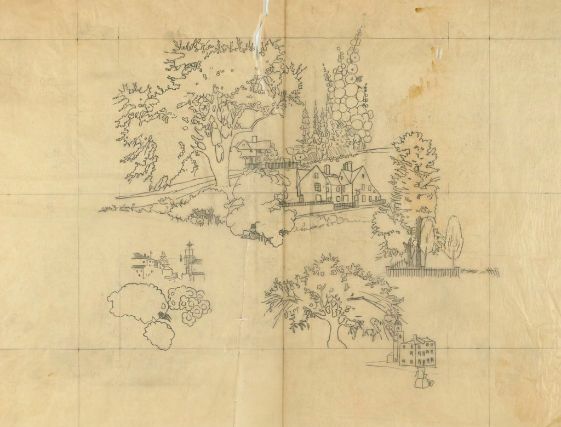 From what I can see, most of the sketches in Fisher’s notebooks in the Museum of Fine Arts contain more conventional preparatory sketches: houses, hills, streams, animals. Creatures, particularly creatures in motion and even more particularly birds, seem to captivate artists for centuries, from Leonardo to Salem’s most famous artist, Frank Benson. 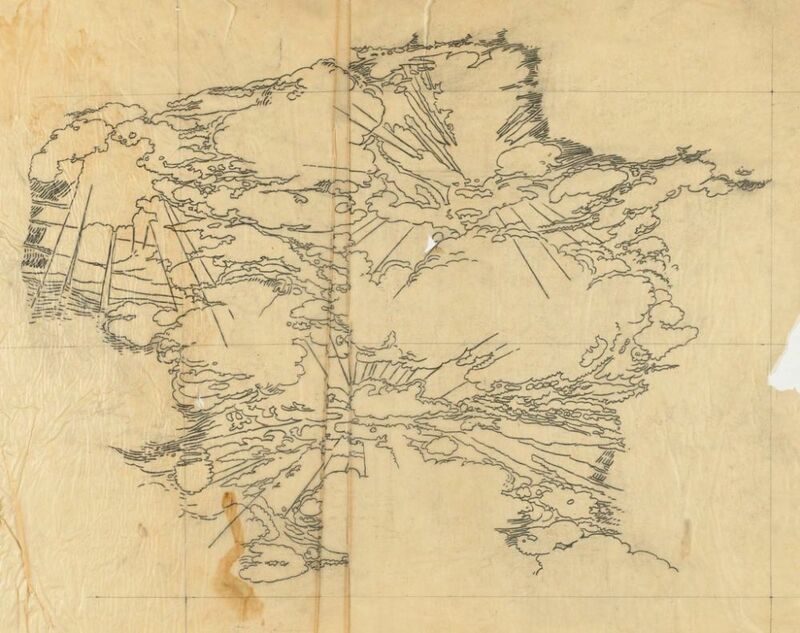 Browsing around sketchbooks which have been digitized (especially those included in this archived exhibition at the Smithsonian’s Archives of American Art), I can’t tell which is more captivating to me: individual sketches or the entire sketchbook, the works themselves or the works in progress. Page from Alvan Fisher’s Sketchbook no. 1, Museum of Fine Arts, Boston; Autographed sketch by Frank Benson, 1882, Skinner Auctions; Leonardo’s sketches from the Codex on the Flight of Birds and one of Benson’s bird sketches, Northeast Auctions; Covers of sketchbooks of Harrison Cady (1943) and Fairfield Porter (1950) from the Archives of American Art. Hans Süss von Kulmbach (German, Kulmbach ca. 1480–1522 Nuremberg), Girl Making a Garland, c. 1508, Metropolitan Museum of Art, New York; John de Critz, the “Tower” Portrait of Henry Wriothesley, 3rd Earl of Southampton, imprisoned following the Essex Rebellion in 1601 with his cat Trixie. Buccleauch Collection, Boughton House. Here we have enclosed portraits of remembrance and appeal: Southampton wants to get out of the Tower, and ultimately King James will release him. Cats are not pets in the pre-modern era, so typically they are depicted in the background, disassociated from humans and being cats: eyeing something to eat, chasing something, lying about. But here we have some very close-up, still, companion cats: unusual. The Southampton portrait and the significance of the cat has been dissected many, many times: my favorite analysis is here. Samuel van Hoogstraten, A View through a House, 1662, Dyrham Park © National Trust; Francis Sartorius, Psyche. A White Persian Cat, 1787, Fenton House © National Trust; J. M. W. Turner, Study of a Sleeping Cat, 1796-97, Tate Britain. In the background and close-up: I just love “doorway” perspective paintings, the cat is kind of incidental in the Hoogstraten painting, but it does indicate how dogs are much more prominently portrayed before 1800! My favorite cats are neither white nor Persian, but somehow Psyche appeals to me. Maybe it is just the exemplary rendering of fur. The early Turner watercolor is just one example of the expansive subgenre of sleeping cats. Unidentified Artist, Girl with a Gray Cat, c. 1840, Karolik Collection, Museum of Fine Arts, Boston; Andrew L. von Wittkamp, Black Cat in a Chair, 3rd quarter of the Nineteenth Century, Karolik Collection, Museum of Fine Arts, Boston; Theophile Alexandre Steinlen, Cat in Summer, 1909, Worcester Art Museum; Eric Ravilious, Edward Bawden in his Studio, 1930. The nineteenth century is the golden age of cat paintings: cats move into the foreground, and even displace dogs in domestic settings (I think; but I could be biased). Certainly the American folk artists of the first half of the century loved cats–they are nearly omnipresent in the works of Zedidiah Belknap and Joseph H. Davis. Not only are they a fixture in the home, but also a subject of serious scrutiny, even preoccupation: so many Steinlen cats. I’m finishing up with another artist’s cat, featured in Eric Ravilious’s study of Edward Bawden in his Studio, from 1930. This is not the most aesthetically pleasing depiction of a cat, perhaps, but as every cat owner (companion? host? feeder?) knows, it is a very characteristic one. For some time I have been trying, very sporadically, to reconstruct the lives of four Salem women called Love: Love Rawlins Pickman (1709-1786), Love Pickman (Frye,1732-1809), Love Frye (Oliver, Knight, 1750-1839) and another Love Rawlins Pickman (1786-1863). The first Love, from a prominent Boston family, married Benjamin Pickman of Salem and gave birth to the second Love, who married into another prominent (though unfortunately Loyalist) Massachusetts family named Frye, and gave birth to the third Love. The second Love Rawlins Pickman, a friend of Nathaniel Hawthorne’s wife Sophia, was, I believe, a granddaughter of the first, niece of the second, and cousin of the third. They are all part of the wealthy and influential Pickman family of Salem, whom I have mentioned several times before on this blog in reference to their amazing houses: here and here. The two Love Rawlins Pickmans really are Salem women–one is buried in the old Broad Street cemetery which I can see from my study, the other up in North Salem–while the in-between Loves, Loyalists that they were, are buried in Britain. I could flesh out more by engaging in more genealogical research but (like most professional historians that I know), I have very little patience for that pursuit, preferring the forest to the trees. 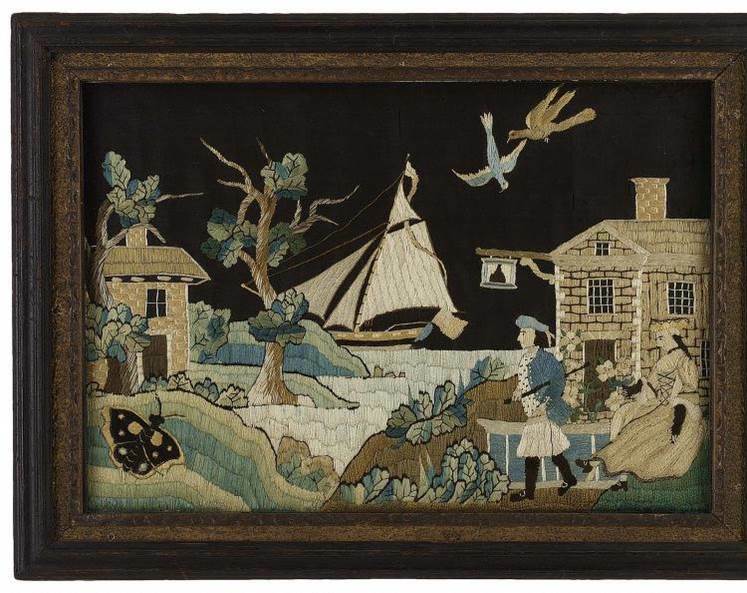 What I’m really curious about is: which Love Pickman made these beautiful embroidered pictures? 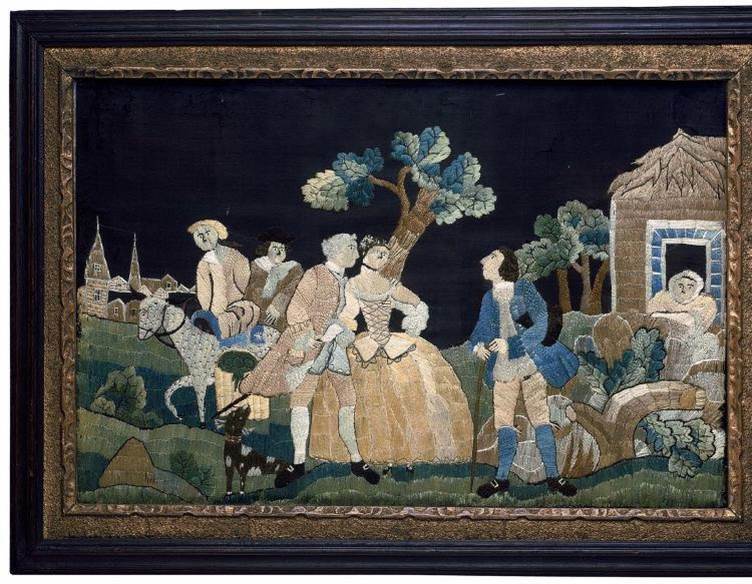 including The Kiss Given, and The Kiss Returned, after 1747, The M. and M. Karolik Collection of Eighteenth-Century American Arts, Museum of Fine Arts, Boston. The curators at the Museum of Fine Art, Boston, attribute these amazing pictorial embroideries to the second Love Pickman, and of course they’re probably correct, but I can find no reference to her as Love Rawlins Pickman, and she would have been quite young, in her early to mid-teens. As a girl from a wealthy Massachusetts colonial family, no doubt she would have been tutored in needlework (though not at the famous Salem school run by Sarah Stivours, which came a bit later: 1778-1794) but I’m wondering if this another extraordinary example of schoolgirl art or perhaps Mrs. Pickman indulged in such artistic pursuits? This is just one query about the elusive-but-everywhere Pickman family–I’ve got lots more. I never tire of expressions of “olde Salem”: books about colonial furniture, furnishings and architecture, old-fashioned gardens, and photographs and drawings of Salem buildings and scenes, real or imagined, from the first few decades of the twentieth century. There appears to have been an entire generation of authors, photographers, architects, and preservationists who either emerged from or descended upon Salem to capture its fiber before it was lost to modernity: Frank Cousins, Mary Northend, Arthur Little, William Rantoul. I’m sure the Great Fire of 1914 intensified their pursuit, and they are also representatives of a national Colonial Revival, of which Salem was a singular inspiration. I’ve covered a lot of Salem stuff in this blog, but I don’t think I’ve focused on fabric before, so I thought I’d take a first stab. I’m inspired by some drawings I found in the collections of the Museum of Fine Arts, Boston by Walter Mitschke, a German-born textile designer for H.R. Mallinson & Company, which specialized in the production of silk fabrics in the early twentieth century. Their most productive and profitable period was in the 1920s, when they offered a series of American prints, many designed by Mitschke: American National Parks, Wonder Caves of America, American Indians, and Early America. 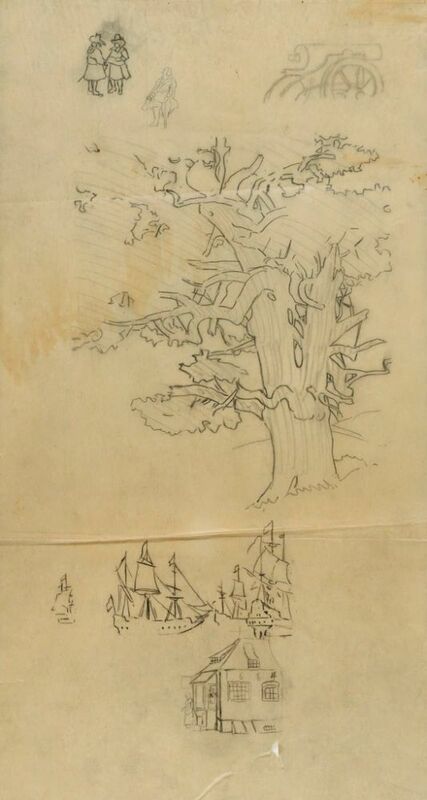 His preparatory drawings for the latter series include several “Olde Salem” vignettes. Walter Mitschke, Drawings for the”Early American” Series of Designs by H. R. Mallinson & Co., 1927, Museum of Fine Arts, Boston. Gift of Robert and Joan Brancale. 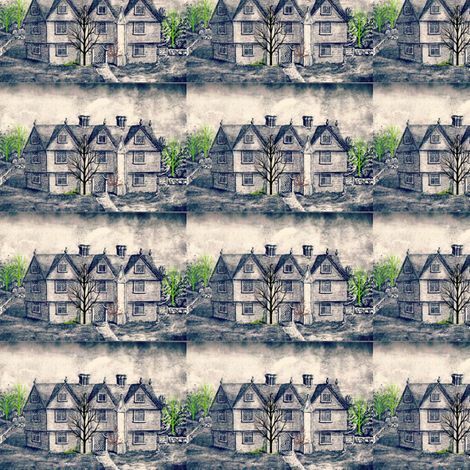 As you can see, the House of the Seven Gables, perhaps Salem’s most iconic “olde” building and image, is front and center in Mitschke’s emerging design. And Olde Salem is most definitely maritime Salem, not industrial Salem or witchy Salem. A large collection of his drawings and fabric samples was donated to the MFA, and you can see several portfolios of his work via the museum’s Interactive Tours. 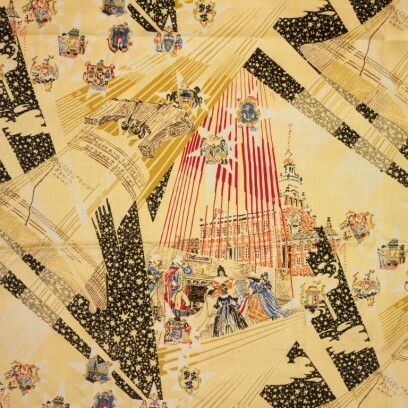 The Museum of the Rhode Island School of Design has some of Mitschke’s finished fabrics, including the very patriotic (and dynamic) Betsy Ross-Liberty Bell print. 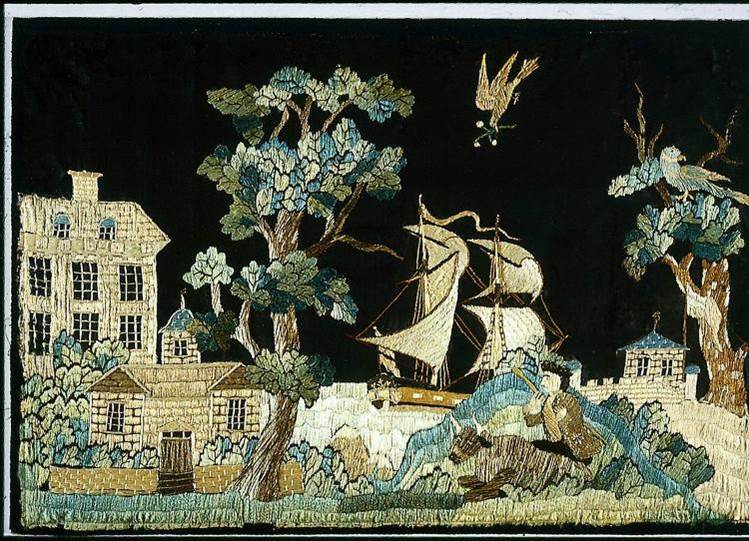 Walter Mitschke, Drawing for the “Early American” Mallinson Series, Museum of Fine Arts, Boston, and Fabric Samples, 1927-28, Museum of the Rhode Island School of Design. I wish I could find the finished product for the Salem drawings; I’m struck by Mitschke’s modernization of “ye olde” images and would love to see the old Gables in such a striking setting. In any case, comparing drawings to finished fabrics is a lesson in how textile designers plotted out the repeat–no small consideration for them. 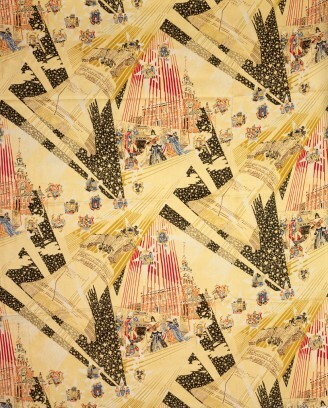 I tried my hand at an old Salem silk print on Spoonflower, and as you can see, I’m no Walter Mitschke! 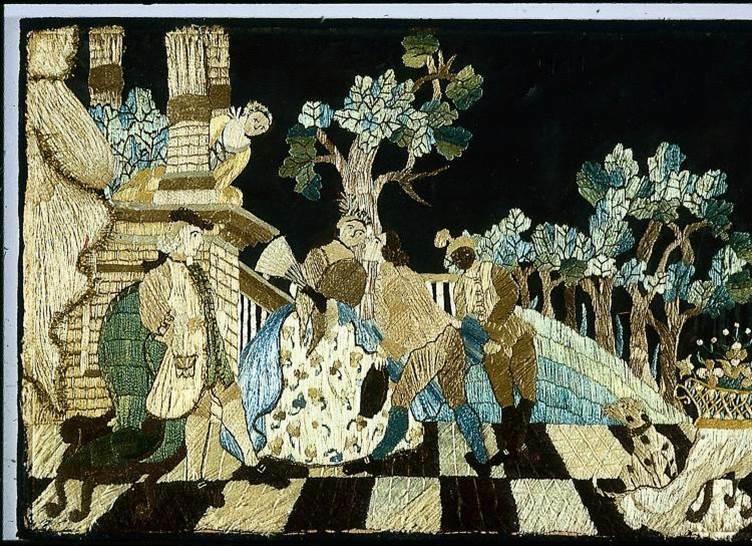 Two more sources for information on Mitschke and Mallinson: this post on the blog On Pins and Needles, and the current exhibition at the Bard Graduate Center: An American Style: Global Sources for New York Textile and Fashion Design, 1915–1928.